Powers/Abilities: Hauptmann was not an imposing physical specimen, but he was certainly willing to use weapons with lethal force against others. He was apparently an inventive genius, capable of grafting machinery to human bodies, and presumably the design of other forms of weaponry. He was more than happy to torture others and he likely shared many of the Nazi philosophies -- though he was willing to serve anyone in a position of power. (Fantastic Four I#87 (fb) - BTS) - Hauptmann served Adolf Hitler during World War II. When the Third Reich fell, he "found another to serve." (Fantastic Four I#85 (fb) - BTS) - Dr. Doom captured Hauptmann from the Red Skull and forced him to serve his cause. (Fantastic Four I#198 (fb) - BTS/Fantastic Four Annual#15/2 (fb) ) - Zorba was captured by Doom, who had his minion, Gustav Hauptmann, experiment on the prince's eyes. Hauptmann replaced his right eye with a cybernetic eye. (Fantastic Four I#85) - Doom summoned Hauptmann to accompany him as he tested his Killer-Robots on some rebels. Hauptmann then reminded Doom of his appointment for his royal portrait. (Fantastic Four I#86) - After Doom released his Killer-Robots on a Latverian village, Hauptmann cautioned Doom that the Fantastic Four might discover the robots' "Achilles heel." Fortunately for Hauptmann, Doom considered this wise council and so did not slay him. Later, Hauptmann was somewhat distraught that Doom was willing to destroy an entire village to stop the Fantastic Four. 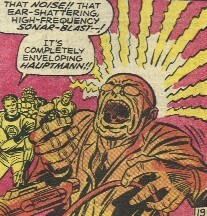 (Fantastic Four I#87) - Hauptmann reported to Doom the Fantastic Four's assault on the Castle. Doom revealed how he intended to lure the Fantastic Four into a certain chamber and then kill them with his Hyper-Sound device. Later, in Doom's art chamber, Hauptmann confronted Doom's painter, telling him that he had checked up on him and learned that he was an agent of SHIELD (Supreme Headquarters International Espionage Law-enforcement Division). Heedless of the artist's warnings about destroying Doom's prized art collection, Hauptmann turned a flame-thrower on the SHIELD agent and on the Fantastic Four, who just arrived in the room. However, Doom was furious: "What are a few vulnerable lives -- compared to the immortal art that might be destroyed?? It must not happen!! It shall not happen!" Doom then re-directed the Hyper-Sound weapon so that it was focused on a single person: Hauptmann. Screaming in agony, Hauptmann collapsed to the ground...dead. Comments: Created by Stan "The Man" Lee, Jack "King" Kirby, and "Joltin'" Joe Sinnott. Hauptmann is German for "Captain." Dr. Doom has demonstrated a high value for art in subsequent stories. In Punisher II#30, the Punisher forced Doom to call off an attack on him by threatening to destroy one of his valuable paintings. Doom's statement about capturing Hauptmann from the Red Skull is particularly interesting. I believe the original Nazi Red Skull (Shmidt) was sent into suspended animation BEFORE the end of World War II, yet Hauptmann describes the falling of the Third Reich, and Doom describes taking Hauptmann from the Red Skull. It is still feasible -- as of 2004 -- that Hauptmann could have been active in WWII and still be seen in the modern era. Perhaps he was very young during the War, maybe 21 years old. He described seeing the end of World War II. That would only make him in his mid-seventies as of right now, and that seems reasonable. However, if Hauptmann was serving as a scientist (which also seems likely), he PROBABLY would have been at least a decade (if not two) older. That's believable, I guess, but will be stretching things within a decade. Certainly he could have had some exposure to some sort of age-retarding factor. If that's the case, he could have worked for the Nazi Red Skull (Shmidt) after he was revived in the modern era, which is when Doom "captured" him. I have another possibility -- more convoluted, but also more interesting. First, after the fall of the Third Reich, Hauptmann could have gone to work for the Communist Red Skull (Malik), whom most of the world believed to be the original. Hauptmann may or may not have believed that to be the case as well. Either way would fit with his line about working for another after the War. He could still have been working for Malik in the modern era when Doom nabbed him, or Doom could have picked him up via time travel at any point. Alternatively, as Doom's WWII adventures shown in the Invaders I#33 was later revealed to have occurred via time travel from the pre-modern era in Marvel Universe#2(fb), he could have encountered Hauptmann (one or both) working directly for the Red Skull (Johann Shmidt), and thus under Hitler (for the most part), too. Doom could have taken one or both of them forward in time to the pre-modern era. Maybe the other that Hauptmann served after WWII was Baron Heinrich Zemo -- maybe Hauptmann "acquired" some of his age-retarding Compound X. In the Fantastic Four Encylopedia his first name became official. HAUPTMANN DEUTSCHLAND [CAPTAIN GERMANY] - see VORMUND.